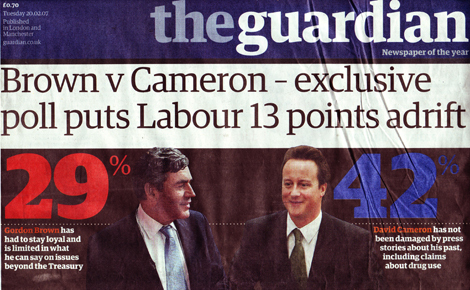 The Guardian/ ICM poll shows that Labour has re-established a lead in all of ‘the battleground issues’. Its smallest lead over the Tories is 1% (on asylum and immigration); its biggest lead is 25% (on overall economic management). A Populus survey for The Times (of just 504 voters on Monday) finds that the Brown-Darling lead over Cameron-Osborne has actually grown since the beginning of the Northern Rock bank run. Labour had a 61% to 27% advantage before the ‘crisis’ but a 56% to 18% lead now. Labour’s standing has fallen but Cameron-Osborne have fallen further. A leader in The Times describes the Conservative response to the banking saga as "intellectually lamentable and politically misjudged". The two Guardian frontpages show that things can change. Brown had been written off but he’s now – apparently – unbeatable. The media over-interpret most things and I don’t think Brown can take the next General Election for granted. Even the biggest critics of Cameron should at least put some hope in events! Last week I predicted that Labour’s lead would widen a little. We had dominated the headlines in the second half of August and Labour had had the better of the news cycle since. Labour’s lead – according to ICM – has grown from 5% to 8% as a result. Disappointing but not a seismic shift to Labour. Things might get a little worse yet. We’re in the Conference season which always distorts opinion polls. The LibDems will get a boost after their Conference. Labour will get a boost after theirs – particularly if Brown finally makes some big policy announcements that have so far been missing from his ‘change agenda’. The polls during the weekend that Conservatives gather in Blackpool might be particularly depressing but we must hold our nerve and wait for real public opinion to become clear towards the end of October. Some of you might fairly comment that we might not have until then. Brown might have called an election before the end of October. A unnamed Cabinet minister told Telegraph.co.uk that there was anything between a 30/70 to 40/60 chance of it happening. He/ she might be behaving mischievously but, on balance, I still expect an autumn poll (and have done since the new year). I have bet lunch with Ben Brogan that there will be one although I hope he’s right and I’m wrong. The critical thing is that CCHQ and all candidates are ready to campaign like they have never campaigned before should Brown blow the starting whistle. In terms of campaigning I suggest two main themes: crime and the NHS. When David Cameron campaigned on crime and social breakdown in the second half of August we won excellent coverage and the polls tightened. The big theme of the Blackpool Conference should be crime. Crime – more than any other issue – is where David Cameron has perfectly blended a traditionalist approach (more prisons, honest sentences, no early release, scrap the Human Rights Act, stricter classification of cannabis…) with his progressive conservatism (ending educational failure, fixing the family, more drug rehab, more support for social entrepreneurs…). The NHS should also be bigged up. Too many voters fear the Conservative leader is too much of a PR guy. David Cameron is genuinely committed to the NHS and it shows. Let’s have more of that passion and commitment. Finally there is the issue of ‘Duracell Dave’. Our leader has hardly stopped over the last month. He couldn’t have worked harder over the last few weeks. He’s given speeches, announced new policies, been interviewed on every platform from This Morning to Today to The Telegraph website. Jonathan Freedland makes the Mike Smithson point this morning that the more David Cameron is in the media the better the Tories do. Despite this morning’s poll I think there’s a lot of truth to that. David Cameron has given 110% in recent times. Other members of the frontbench now need to do much more, too. We need more Chris Graylings and where is Caroline Spelman? Can anyone remember her doing anything since becoming Chairman? And – please everyone – let’s not have another Chicken Licken thread. Is it too much to ask to try and have a positive, constructive discussion?